Over the years, Adidas has been able to take their ultra-comfortable midsole technology, Boost and implant it onto some great silhouettes which have become extremely popular over the last few years. Some of those models are the NMD and of course, the UltraBoost which is considered by many as the best running shoe on the market. Now, the brand with three stripes has added Boost to a retro-inspired sneaker in the Adidas Nite Jogger. There have been a few colorways of the Nite Jogger to release so far, and now, Adidas is teasing another brand new version in a familiar color scheme. 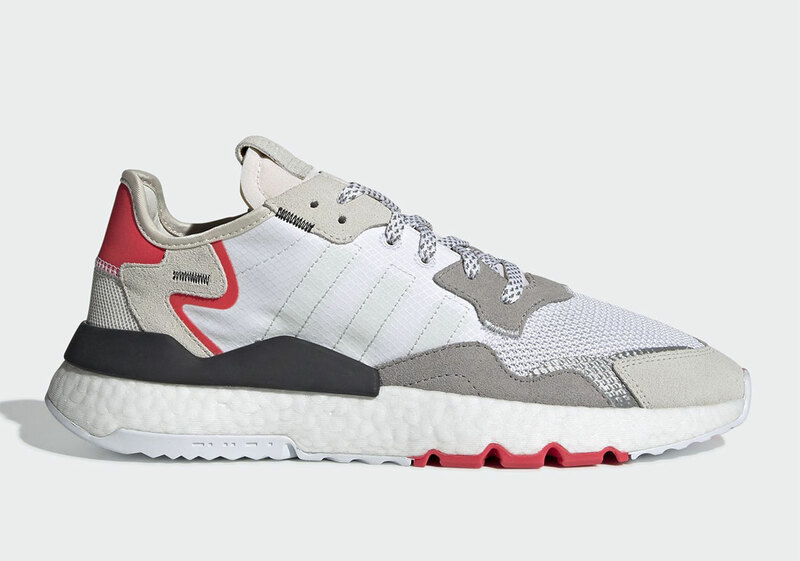 There is no official name for the colorway although based on the product description "Light Grey and Red" will have to do for now. The nomenclature makes sense when you look at the shoe and see the different shades found throughout. The upper is made of white mesh and knit, while grey hits of suede are sprinkled everywhere. Finally, red highlights are found on the back heel and the outsole. According to Sneaker News, this brand new colorway will be hitting stores in April and will retail for $130 USD. An official date has not been announced just yet.